Stunningly compact, the Power Mac (not Macintosh) G4 Cube came as a surprise, despite numerable contradictory rumors. Just 7.7" square and a bit under 10" tall, the Cube does everything the iMac DV does (except contain a monitor) - but with the same 450 MHz G4 processor as the Power Macintosh G4. 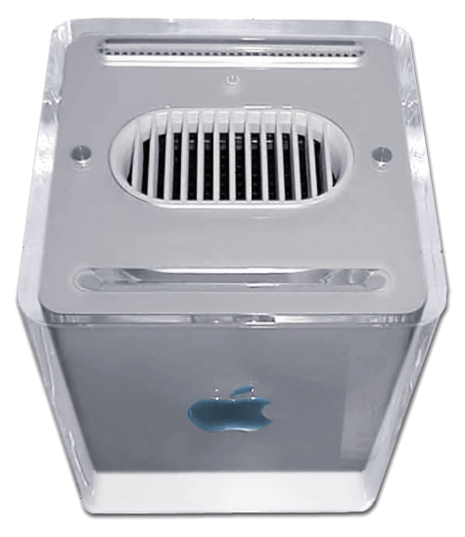 The Power Mac G4 Cube (or, as Steve Jobs put it, "more affectionately, the G4 Cube") was a small form factor Macintosh personal computer from Apple Inc. It was sold from 2000 to 2001. Its cube shape is reminiscent of the NeXTcube from NeXT, acquired by Apple in 1996. The machine was designed by Apple industrial designer Jonathan Ive. The New York Museum of Modern Art holds a G4 Cube, along with its distinctive Harman Kardon transparent speakers, as part of its collection.